Durango 95 and A Clockwork Orange The droog mobile from A Clockwork Orange. Some movie cars are known for incredible speeds or impossible jumps. Others are considered icons simply because they’re rare or unusual. This car is just plain weird, and is from the only X-rated film in history to receive an Oscar nod for Best Picture, Best Director, Best Film Editing and Best Adapted Screenplay. We’re going to take a look at the criminal droog mobile, the Durango 95 and the film it originates from, Stanley Kubrick’s A Clockwork Orange. Kubrick, who was already famous for the massive blockbuster 2001: A Space Odyssey, didn’t initially want to do the film. It was a concept piece he felt couldn’t live up to the author’s vision. Kubrick’s wife convinced him of the many levels and depth his storytelling could bring if he was the one behind the wheel directing this film. He was convinced. The film has several depictions of violence of different kinds riddled throughout. When it was released in the early 1970s, the film was accused of inspiring copycat break-ins and murders in the UK, and as a result, the media called for it to be banned. However, it wasn’t banned until Kubrick began receiving death threats claiming his London area house would be broken into and his family would be murdered in a fashion similar to the movie. The morally conservative people pf the UK also picketed his home to protest the content of the film. At this point, Kubrick lobbied the studio to stop showing the film publicly in the British Isles and Ireland until after his death, which happened in 1999. In the film, the main character Alex (played by Malcom Macdonald) is part of a violent and murderous youth gang in a dystopian UK of the future. One of the stars of the show is a futuristic car sporting one of the lowest profiles around, making this car one scary ride. Add in a single sliding glass door roof and you have the making of something straight out of a production designer’s fantasy (or nightmare). Fitting for a movie about extremes, this car has a vision and direction that made each scene as edgy as possible for the time period. Introducing the car of the future (from the early ’70s) the M-505 Adams Brothers Probe 16, referred to in the film as the Durango 95. The film was filled with dangers during its construction. The Probe 16 was so extremely low to the ground to the ground, it was a hazard to those riding inside. As an extra measure of safety, the country roads used for filming needed to be cleared beforehand to prevent accidents. 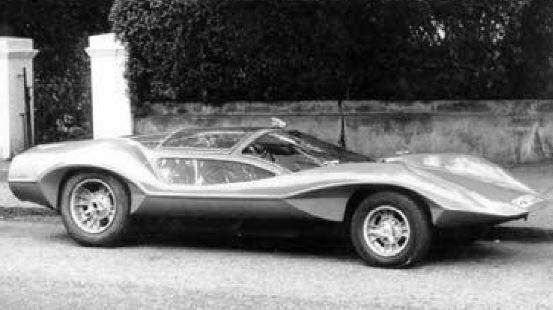 The car was designed by former Marcos cars designers Dennis and Peter Adams in 1969 as “an investigation into extremes of styling.” It’s argued that the brothers wanted to attempt to build the lowest-riding vehicle possible. It stood a mere 34-inches (86 cm) in height with 10-inch wheels on the front and 13-inch wheels on the back. Entry was gained via the sliding glass roof. The car ended up being a rear wheel drive which was powered by a mid-mounted tuned 1.8-liter Austin 1800 engine that would have had a gross horsepower of 86. Not that impressive, but with the low profile and ultralight body, this car offered a unique ride. The Adam’s Probe 16 is one of the rarest cars, with less than five built and even fewer in running condition. A memorable car used in an unusual movie that had an extreme visual impact on those who loved the film, or just sci-fi in general. The car has had several owners since the filming. It’s also changed body color from silver in the film to a bright yellow, and then finally orange and black. Its condition wasn’t always stellar. Between the yellow and orange repaint, the car was in parts and had fallen into disrepair. It was brought back to the public’s eye when it was nominated for a complete restoration under the glare of Top Gear’s Season 5 cameras. It wasn’t chosen for the restoration and instead was picked up by an interested buyer. Since then several auto clubs have restored the car and given it its final paint job. It’s currently under the care of Club Autosport Ltd.
Wither you’re a fan of Kubrick’s film or this extremely rare car from a dystopian future, A Clockwork Orange and the Adams’ Probe 16 make a weird visual combination.